We make sure you are comfortable and at ease. Dr. Wooddell and his staff strive to provide dental care for our patients in the most comforting manner possible. This is known as gentle dentistry. We realize that dental procedures often evoke some degree of anxiety in people. Dr. Wooddell practices gentle dentistry to decrease the anxiety and make you comfortable and the procedure painless. We have nitrous oxide (laughing gas) available to allay anxiety. We find that this is often very effective on anxious adult patients and even more useful with children. (Usually, no local anesthetic injection is even required on children with the use of nitrous oxide.) If a local anesthetic is necessary, Dr. Wooddell will first place a topical anesthetic on the area to be numbed. We also can prescribe anti-anxiety medications for our patients to be taken prior to the procedure. We encourage patients to bring whatever music they would like to listen to (Iphone, MP3 player, etc.) Finally, we find that by clearly explaining any planned procedures (what the procedure is, why it is being done), we can eliminate much of the patient’s anxiety. We believe that by combining these methods with gentle dentistry and thorough, compassionate care, we provide comfort to our patients and reduce the level of anxiety for future dental visits. Our Annandale, VA dental office is conveniently located around the corner from INOVA Fairfax Hospital, near Vienna, Burke and Fairfax, VA. For more information or to schedule an appointment, please call 703-698-9698. 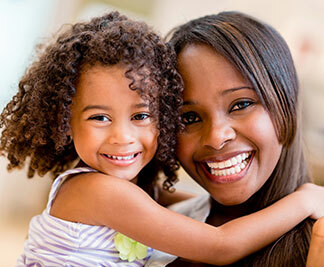 We practice gentle dentistry for the entire family.